Burlap, a textural brown fabric, is a popular choice for DIY projects, as it's a low-cost material that helps to make home decor projects affordable. If you have a roll of burlap that you are not sure what to do with, here are 18 home decor DIY projects that are sure to inspire you! BEvery home needs a set of drink coasters to protect wood tables from damage. Dedicate some time to craft a set of burlap-edged leather coasters for your coffee table–beautiful and functional! Add some coastal charm to your home by framing burlap and starfish together to create some inexpensive and easy nautical wall art. Many people choose to decorate their home with large leafy plants–not only is it a way to improve the air quality in your home, but they also contribute to the style of a room by balancing the layout or softening architectural details. The problem is that most large planters are expensive, while inexpensive plastic pots can often look ugly. One easy solution is to cover your cheap plastic pots with burlap, creating a lovely textural planter that adds interest to any room. It is hard to tell, but the background of this beautiful wall scroll is a recycled burlap coffee beans bag. For an alternative to photo frames, the fabric of the coffee bag provides a textural background for a piece of art, which can be hung on the wall as a scroll with a small piece of string. 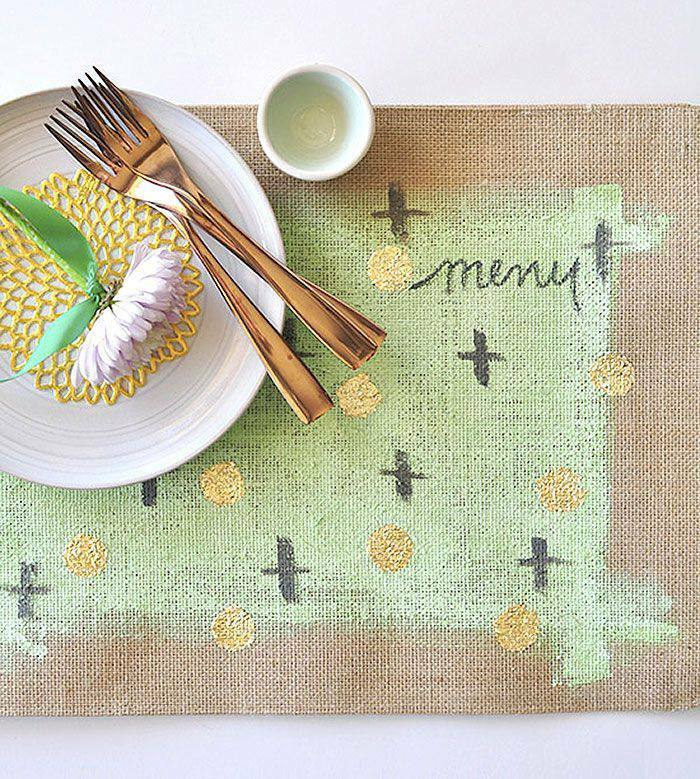 Give a fresh look to your old burlap placemats with acrylic paint and gold leaf to create a modern set of placemats with chic metallic detailing. Help keep your clothes smelling fresher longer with these essential oil scented burlap sachets for your drawers. These burlap drawer sachets will keep their scent for a long time, helping to maintain a fresh smell to your clothes, long after you wash them. No matter your level of artistic talent, you can create some modern graphic art for your home with this DIY project! Using sheets of freezer paper, you can make simple stencils to help you paint your abstract art onto pieces of burlap. This DIY wreath is perfect to adorn your front door year round. It's made with burlap ribbon and faux succulents. After a long day at work, there is nothing better than coming home and lounging on the sofa with your feet propped up, while you catch up on your favorite Netflix shows. Help yourself get comfortable with this burlap ottoman to rest your feet on. Update that old table lamp in your home with a new lampshade. Using small strips of burlap, cover the old lampshade frame to add rustic appeal. You can also repaint the base if you choose to give the entire lamp a complete makeover. The next time you visit a craft store, be on the lookout for burlap covered boxes, which are perfect for turning into hand-lettered gift boxes. Or, if you can't find any ready-made burlap boxes, cover generic boxes with burlap fabric. These are perfect little gifts or party favors! Add some romantic flair to your home decor with a lovely burlap heart. Hang it lopsided on the wall to add some interest, and pair with pretty glass bottles to capture farmhouse-style. Get ready for your next vacation with this burlap beach bag DIY. It's the perfect size for holding all your beach essentials, including those bulky beach towels. Practice your crochet skills with these small crochet rosebuds that add a pretty spot of color to this homemade burlap wreath. The completed wreath would look great on your fireplace mantel, hung on a wall or the front door. Set the table for your next dinner party with homemade burlap napkin rings. Wouldn't these look especially great at a Farmer's Market themed party or even a chic backyard wedding? This DIY wreath is the perfect budget-friendly craft project–all you need is burlap to cover the wreath, and some felt to make the flowers. DIY Burlap Desk Organizer. Kleinworth & Co.
Keep your desk organized with this burlap pen holder. Add a vase of flowers, a pretty succulent and some handmade mugs for your morning (and afternoon) coffee, and you desk will be the envy of everyone in your office. DIY Burlap Desk Organizer Tutorial from Kleinworth & Co. Skip the overpriced baskets at the department store and keep organized with these rustic-chic burlap-covered boxes instead. They're perfect for storing items such as scarves and hats in your closet or laundry room.